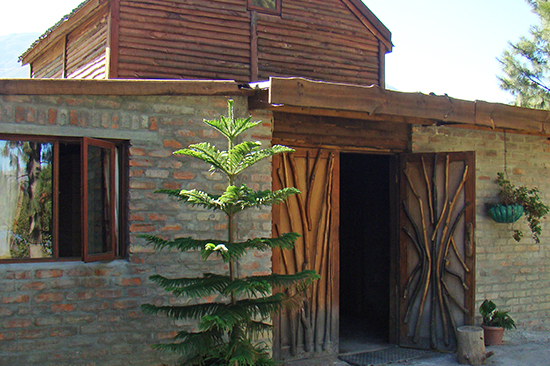 Turqle's producers are diverse - some big and ultra sophisticated, some small and almost rustic. They have one thing in common though: a true love of food and a real commitment to doing their best, better. Turqle chooses producers for the quality of their products AND their commitment to fair trade. "We check our producers - and three sets of independent auditors check us - so our customers and their customers, don't have to..."
Turqle is a Guaranteed Fair Trade Organisation under the WFTO Guarantee System, which means it has a comprehensive Internal Fair Trade Monitoring System in place. Turqle is certified by Fairtrade International as a Licencee and a Trader in Wine Grapes and Herbs and Spices. Fair For Life (IMO) has certified Turqle Trading as a handler of Fair Trade ingredients. What does all this mean? Most years, Turqle's fair trading practices are audited twice a year - and some years, three times! These audits are costly - in terms of time, money and energy - but this is the price of being able to claim a true commitment to Fair Trading. Turqle producers are required to have (and maintain) all the necessary food safety certifications. Turqle regularly checks food safety compliance. Each product has a detailed product specification sheet that is compiled with the manufacturer and the suppliers of the various raw materials. These specification sheets are revised regularly and current copies are on file at Turqle's office, with the manufacturer and at the customer's office. Orders are only shipped on a positive release - it means there's a raft of pre-specified microbiological and chemical tests the product has to pass before it is shipped. One of the fair trade customers' expectations Turqle has to manage, is the notion that everything fair trade comes from small producer groups in quaint rural settings. While consumers in the first world love craft products that are made in rural settings, they expect their food to come from factories with first world food safety systems. "Food is a trade of trust - people trust us enough to eat our products..."
Food is a trade of trust - our primary role in this trust transaction is to ensure that the food is the best it can be - and also up to (and in some cases beyond), the standards that apply at manufacturers in the first world. This cycle of trust has to be 'got right' again... and again... and again... 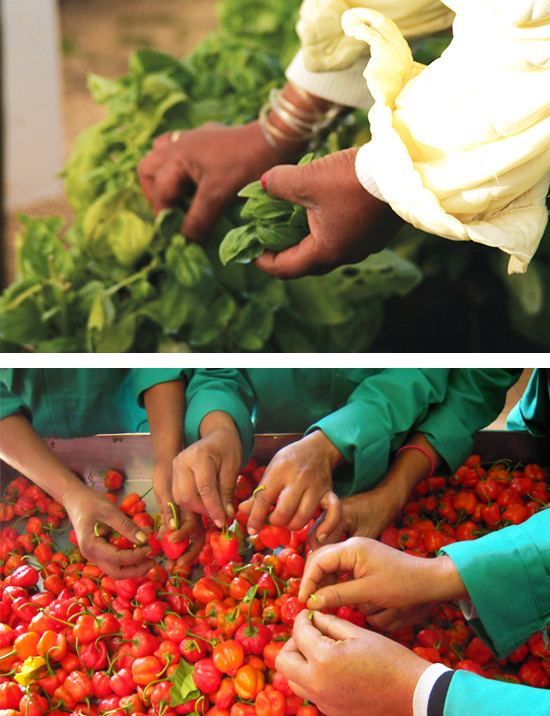 There is no room for error: we're asking people to eat what we make - and come back for more! in Wellington make the Cape Treasures mustards. They first started experimenting with semi-grain mustards more than 20 years ago and in a short time perfected a technique that yields a table mustard that is popular in Europe - there are even fans in Germany, where they have a well established mustard culture of their own. There is an artisinal charm to the process - a lot of it has to be done by hand and there's a huge component of skill and judgement to getting it just right. The mustards have depth and an honest autheticity about them. The mustard seed and powders may be imported from Canada (that is where all the BEST mustards come from) - but its the energy of the Nantekara people who make it wonderful! 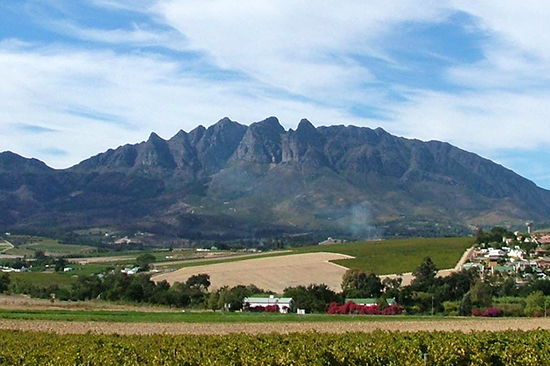 (on the banks of the Theewaterskloof Dam near Villiersdorp) smokes the Cape Treasures Olive oil. In a very short time after Aphro Shack started supplying Cape Treasures with smoked olive oil, it became clear that while they could keep up with smoking the oil, procuring the bulk oil and bottling it was beyond the capacity of their little smoke-house. Just for a start, the road leading down to the smokehouse is so steep and so narrow, no large delivery trucks can make it down the hill (without running the risk of landing up in the dam!). 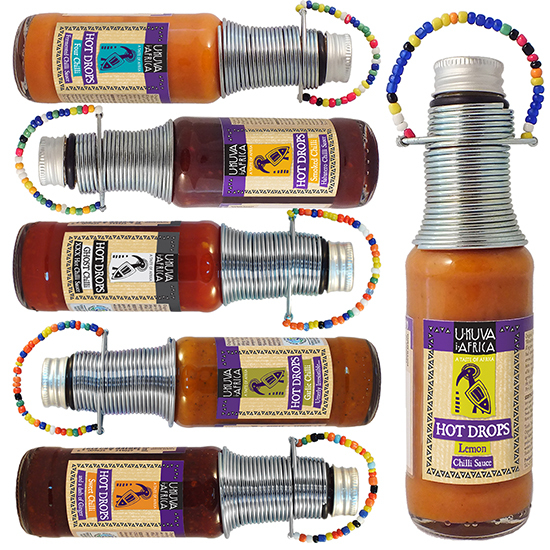 near Malmesbury in the Swartland, make the Cape Treasures Relishes, the Smoked Seasoning, the Ukuva Hot Drops and Ukuva's Harissa sauce. There is a very special energy in products that are made by the people who grew the ingredients and constructed the recipes. The peppers in Smoked Seasoning are grown, dried and smoked within meters of where it is eventually bottled. The same for the relishes. Perhaps it is the rich soil of the Swartland - perhaps its the heat and the sunshine and the clean air... the peppers grow redder, tastier and bigger than anywhere else... so do the aubergines and tomatoes and basil. The Fynbos people take special pride in making products that are packed with the 'good stuff' - they do not add fillers or preservatives or colourants - every product is pure vegetable goodness through and through. 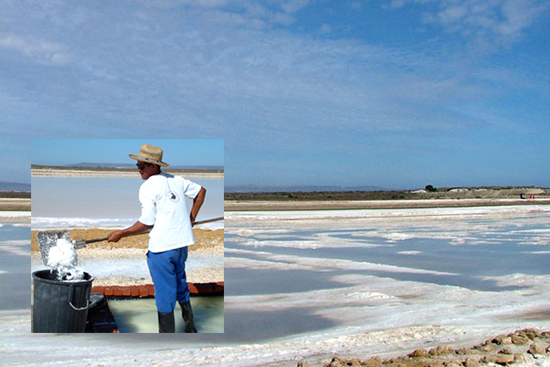 which is near Veldrift on the Cape West Coast (about 140km from Cape Town) make the salt that is used in all the Ukuva Herb and Spice grinders and the fine salt shakers in the Cape Treasures range. Created by the sun and wind, this is salt the way its been since the time of the first people - perfect crystals of pure Atlantic sea water. At the salt pans, the area is vast - the horizons stretch into eternity - and mostly its just the sea and the sky and the salt pans. The air is so clean here, people feel revitalised just breathing - and on windless days, the silence is so complete, one can hear the salt crackle as the crystals form and settle. There is nothing 'instant' here - the salt only forms when the conditions are right... and it can take a long, long time. 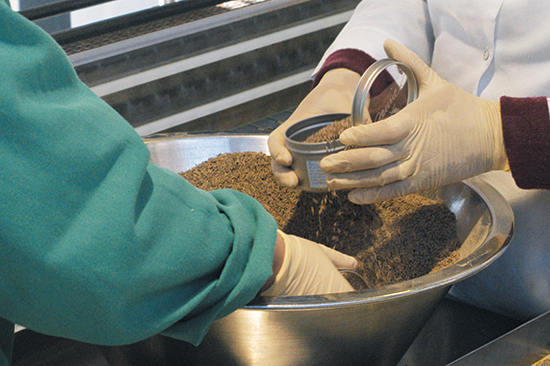 After harvesting, the process is remarkably simple: cleaning, sieving (to sort the large from the small and the fine grains), picking (to remove any bits of stone and shell that might have passed the sieves). There are no harsh mechanical processes : high heat drying ovens, crushing and grinding that destroys the natural sea minerals - each crystal stays just as it was formed: pure, perfect and complete. 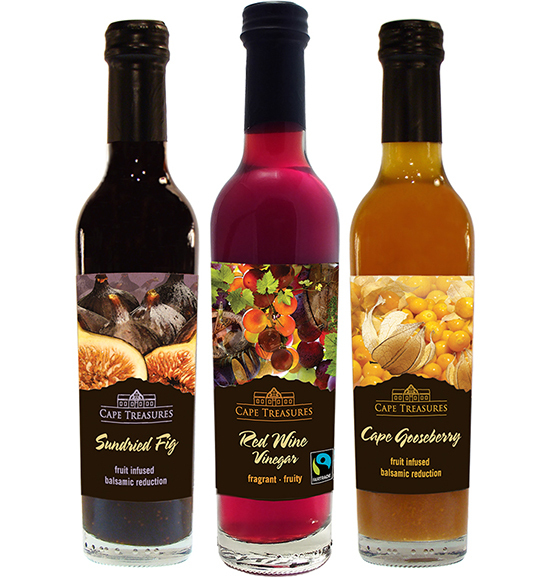 just outside Somerset West, make the Cape Treasures Fruit Infused Balsamic Vinegars and the Fairtrade certified Red Wine Vinegar. Developing the first Fruit Infused Balsamic Vinegar Reductions was an act of pure love for food and good taste. The energy Adrienne put into the very first bottles, is still there today. Its in the careful selection of the ingredients and in the process of 'infusing' and 'reducing'; they have mastered the art of getting it just right, every time. There is a timelessness - a truth beyond the food fads - of the role of vinegar in good food and classic cooking. A really good wine vinegar is often one of the 'secret' ingredients great chefs use to balance a flavour, create an accent or layer the taste experience in a dish. Great vinegar is made from good wine - there is no other way - the vinegar will always reflect its origins. 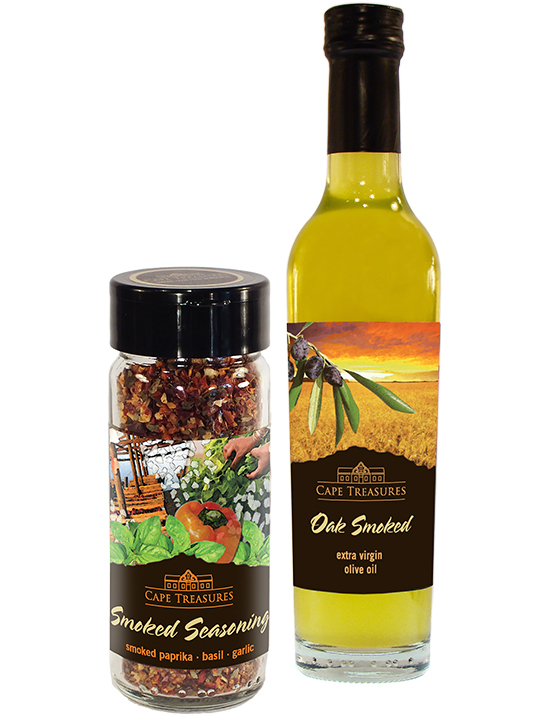 Cape Treasures Red Wine Vinegar was made from the best wine by people who know how to make good vinegar. are in the Westlake area of Cape Town. 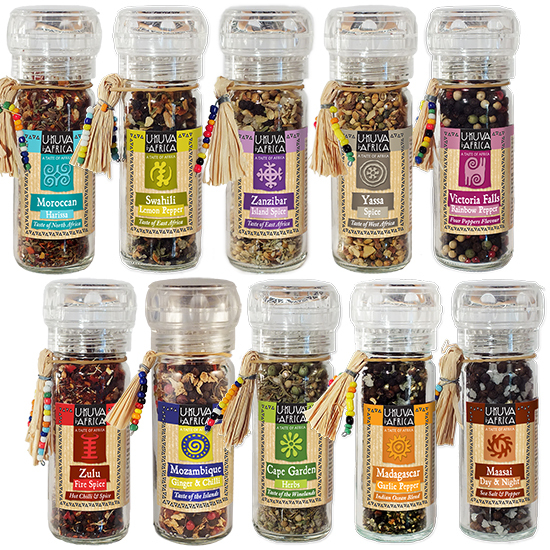 They make all the Ukuva Herb & Spice Grinders, all the Cape Treasures Seasoning Solutions and most of the Cape Treasures flavoured salt - no wonder they needed such a large factory! Right from the very beginning, Cape Herb and Spice was driven by the love of spice, a fascination with the alchemy that happens between food and spice to create sublime flavours: a true and lasting passion for all things spice... and that has not changed. Beyond the immediate, they keep exploring, keep adding to their knowledge, keep working their master craft into their products - and every now and then create a blend (or two or three) that are truly inspired. 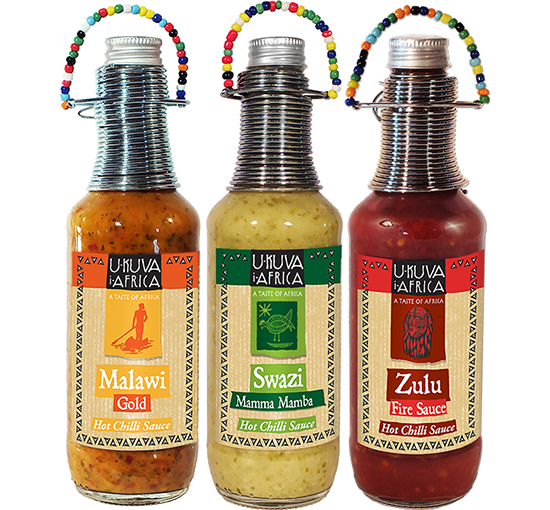 in Stikland make the Ukuva Sauces - the legendary Swazi Mama Mamba, Zure Fire Sauce, Malawi Gold and their siblings. In the beginning (about 20 years ago) the Ukuva sauces were made in vast cookers on the back porch of Nigel's cottage on Rose Street. This was fine in Summer, but when the Winter rains came, they moved to a little factory in Schiebe Street, and when they outgrew that, they moved to Roodehek Street. When the facility at Roodehek - which still had a measure of rustic charm - became too small, the 'step-next' was a 'proper' factory... and production moved to Afoodable in Montague Gardens and three years later, St Louis in Stikland became the official makers of Ukuva Sauces. From a production point of view, the Ukuva sauces are not easy - most of them require loads of real, fresh ingredients : bunches of carrots, real, fresh sweet potato and fresh coriander (that arrive from the market complete with sandy roots! ), as well as real onions and garlic and enormous crates of whole, fresh chillies... so the Ukuva Sauces were fortunate indeed that the dedicated team at St Louis were willing to get in there and go the extra mile to make it happen - and all for the love of great sauces! (or Workshops Unlimited) in Athlone is a protected workshop for people with mental disabilities. They make all the wire heads and tassles on the Ukuva products. This is a very valuable source of income for the group and they take great pride in the fact that their handiwork is exported all over the world. At the heart of Cape Treasures and Ukuva, is Turqle's commitment to transparency, sustainability and accountability; the process of fair trade and fair trading and of supporting and growing opportunities in South Africa. At its most basic, its about creating and maintaining fair trading chains - from the farm to the fork: healthy fair trading businesses that will create resilient industries, strong communities and wholesome families. These things do not happen by accident. They cannot be bought in a kit and 'installed'. They have to be built - carefully, mindfully - with much cooperation, energy, commitment and time.